• Renamed from "Yue" to "Han"
Southern Han (Chinese: 南漢; pinyin: Nán Hàn; 917–971), originally Great Yue (Chinese: 大越), was one of the ten kingdoms that existed during the Five Dynasties and Ten Kingdoms period. 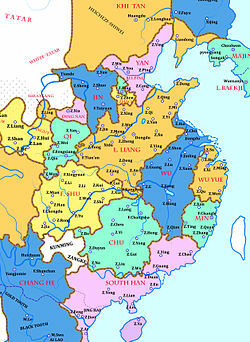 It was located on China's southern coast, controlling modern Guangdong and Guangxi. The kingdom greatly expanded its capital Xingwang Fu (Chinese: 興王府; pinyin: Xìngwángfǔ, (present-day Guangzhou). It attempted but failed to annex the Tang province of Annam (modern northern Vietnam). Liu Yin was named regional governor and military officer by the Tang court in 905. Though the Tang fell two years later, Liu did not declare himself the founder of a new kingdom as other southern leaders had done. He merely inherited the title of Prince of Nanping in 909. It was not until Liu Yin's death in 917 that his brother, Liu Yan, declared the founding of a new kingdom, which he initially called "Great Yue" (大越); he changed the name to Great Han (大漢) in 918. This was because his surname Liu (劉) was the imperial surname of the Han dynasty and he claimed to be a descendant of that famous dynasty. The kingdom is often referred to as the Southern Han Dynasty throughout China's history. Some modern scholars have been trying to ascribe a foreign origin to the Liu of Southern Han and attack the traditional historical records and the claims of the Liu clan themselves that said their ancestors were Han Chinese from northern China who migrated south. Historical texts like the Old History of the Five Dynasties and the New Book of Tang record that this Liu family said they themselves originated in northern China, from Shangcai in Henan and Pengcheng in Jiangsu until their ancestor Liu Anren (劉安仁) migrated south to Fujian and Guangdong and the Southern Han Liu emperors claimed to be Han Chinese descended from the Han dynasty royal family who shared the same surname, Liu. Liu Zhiqian was of low class and rank and because of this the aristocratic Wei family said he was "not of our kind" (非我族类) but despite Liu's low rank, the military governor Wei Zhou married his niece to Liu Zhiqian over his family's objections. The Japanese scholar Fujita Toyohachi in 1910 tried claiming that the Liu family of Southern Han were descendants of Arabs who came to Fujian and Guangdong by sea by pointing to an Arab from the later Song dynasty who used the surname Liu and claiming it sounded similar to Arabic names like Ali or Alaa, and claimed that the Liu family tried to for Han ancestry from northern China. His claims of the Liu being of Arab or foreign descent were rubbished and attacked by another Japanese scholar, Masahiro Kawahara who pointed out it was a custom for reigning Chinese Emperors to grant the usage of their surnames to foreign merchants like the Tang dynasty which granted the imperial family's surname Li to foreigners, and that the foreign Arab merchant likely received his Liu surname from the reigning Liu Emperors of Southern Han and not the other way around, and he pointed out that the Southern Han did not believe in Islam but practiced Buddhism. Masahiro suggested instead that the Liu were from a local non-Han native ethnic minority of Guangdong from Fengzhou who then forged Han descent from northern China to claim descent from the Han dynasty. Both Fujita and Masahiro's theories were attacked by another historian because both of their theories are based on their own pure conjecture and opinions and have no solid evidence or historical data or texts to support their claims, saying that the phrase "not of our kind" "非我族类" referred to the socially stratified Tang dynasty aristocracy in China since 族 means clan the Liu were not a clan of the Wei's social status ("Not of our clan") and not referring to the modern meaning of 族 which means ethnicity or race, and using this statement "not of our kind" to suddenly jump to the conclusion that they were "Arab" is massively inappropriate for a historian. The aristocratic Wei family would have looked down and despised people of low rank like the Liu. Masahiro's suggestion that the Liu were native non-Han ethnic minority also has no evidence based in any historical texts and there is nothing to suggest that the existing historical texts like New History of the Five Dynasties are false. Both are seen as theories with no proof. The Southern Han did not believe in Islam and were not Sultans. Arabs referred to the Southern Han as the "Chinese rose" monarchy because that rose originated from China, Guangzhou was known as the flower city and Southern Han planted lots of roses. Statues of two of he last Southern Han Emperor's Liu Chang's sons were described as looking like "barbarian devils". The two sons may have come from a Persian woman who was Liu Chang's concubine. A large number of Han Chinese moved to southern China like Southern Han as the Tang dynasty was collapsing and helped build Southern Han when it become independent.The arguments over the origin of the Liu family who ruled Southern Han again were looked at and determined that they were Han Chinese. Liu Yan's tomb was found to Beitang village's south. The Southern Han spread sinicization in the lands they ruled. With its capital at present-day Guangzhou, the domains of the kingdom spread along the coastal regions of present-day Guangdong, Guangxi, Hanoi and the island of Hainan. It had borders with the kingdoms of Min, Chu and the Southern Tang as well as the non-Chinese kingdoms of Dali. The Southern Tang occupied all of the northern boundary of the Southern Han after Min and Chu were conquered by the Southern Tang in 945 and 951 respectively. While the Tang Dynasty was strong, the region of the present-day Vietnam remained a stable, secure part of the Southern Han's Viet domains. However, as the Tang weakened late in the 9th century, the Viet sought to regain control over their own affairs. Hanoi, which had developed as a political center during the Tang Dynasty, was the center of an early Vietnamese polity. The Southern Han sought to bring the Viet into its orbit; however, their invasion was unsuccessful and was repelled. In 939, the Viet in the Chinese province of Annam, under the leadership of Ngo Quyen (吳權), redeclared independence. The Five Dynasties ended in 960 when the Song Dynasty was founded to replace the Later Zhou. From that point, the new Song rulers set themselves about to continue the reunification process set in motion by the Later Zhou. Through the 960s and 970s, the Song increased its influence in the south until finally it was able to force the Southern Han dynasty to submit to its rule in 971. Mote, F.W. (1999). Imperial China (900-1800). Harvard University Press. pp. 11, 15. ISBN 0-674-01212-7. Schafer, Edward H. "The History of the Empire of Southern Han: According to Chapter 65 of the Wu-tai-shih of Ou-yang Hsiu", Zinbun-kagaku-kenkyusyo (ed. ), Silver Jubilee Volume of the Zinbun-kagaku-kenkyusyo. Kyoto, Kyoto University, 1954. Tarling, Nicholas, ed. (1999). The Cambridge History of Southeast Asia (Volume One, Part One): From early times to c. 1500. Cambridge University Press. p. 139. ISBN 0-521-66369-5. ^ Schottenhammer, Angela (2015). "CHINA'S GATE TO THE SOUTH: IRANIAN AND ARAB MERCHANT NETWORKS IN GUANGZHOU DURING THE TANG-SONG TRANSITION (c.750–1050), PART II: 900–c.1050" (PDF). AAS WORKING PAPERS IN SOCIAL ANTHROPOLOGY. Wien: Austrian Academy of Sciences. 29: 1–28. doi:10.1553/wpsa29. ISBN 978-3-7001-7880-4. (webpage). ^ Miles, Steven B. (June 2002). "Rewriting the Southern Han (917-971): The Production of Local Culture in Nineteenth-Century Guangzhou". Harvard Journal of Asiatic Studies. Harvard-Yenching Institute. 62 (1): 45. doi:10.2307/4126584. JSTOR 4126584. ^ 李, 庆新. "南汉对外关系与海外贸易". 中国经济史论坛. ^ 李, 庆新 (2010-11-04). "南汉对外关系与海外贸易". 中国经济史论坛_ 国学网. ^ 周, 加胜 (2008). 南汉国研究 (博士 PhD). 陕西师范大学. ^ 崔, 北京 (2006). 南汉史研究 (硕士 Masters). 陕西师范大学. (page link). This page is based on the Wikipedia article Southern Han; it is used under the Creative Commons Attribution-ShareAlike 3.0 Unported License (CC-BY-SA). You may redistribute it, verbatim or modified, providing that you comply with the terms of the CC-BY-SA.